STARBODIES™ Whey to MUSCLE is a Premium, Australian lon Exchange Whey Protein Isolate. It is NOT an inferior whey blend or concentrate like many other brands on the market. 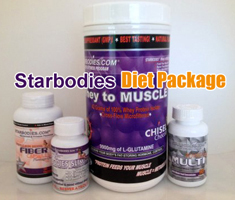 STARBODIES™ Whey to MUSCLE is a Premium, Australian lon Exchange Whey Protein Isolate. It is NOT an inferior whey blend or concentrate like many other brands on the market. And because we wanted only the very best for our customers, we also ADDED 4600mg of L-Glutamine per serving. Plus, the 5300mg of L-Glutamine that naturally occurs in STARBODIES™ Whey, makes your STARBODIES™ Whey to MUSCLE contain a whopping 9900mg of L-Glutamine per serving. Unlike many other Ion Exchange derived Isolates, your STARBODIES™ Whey to MUSCLE is rich in Glycomacropeptides (GMP), which research has proven very positive as an appetite suppressant, and shown to promote lean muscle growth. It is also rich in Branch Chain Amino Acids, Beta Lactoglobulin, and Alpha Lactobumin in their native state, not to mention that it is extremely Low in Lactose. Because STARBODIES™ Whey to MUSCLE is made with only Premium, Quality Ingredients, you can taste the amazing difference! Most other companies use artificial flavors mixed with some natural flavors, but we used only Natural Flavors because our taste can’t be beat! You’ll taste the difference & be shocked! Why chug down a bad tasting protein shake when you can finally have the best Quality & Flavor combined? 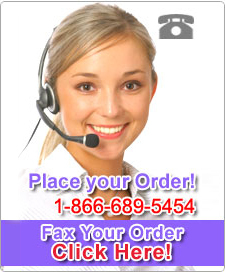 You and your lean body will love it! Research suggests that you consume between 1-1.5 grams of protein per pound of lean body weight (muscle). And with just food alone, it is quite difficult to consume adequate amounts of needed protein, without going over your daily calorie requirements. STARBODIES™ Whey to MUSCLE will help you meet your needed protein requirements every 2-3 hours, to feed your muscles, and still stay within your calorie limits...even with your busy schedule. Remember, the more muscle mass you have, the higher your metabolism will be. The higher your metabolism, the more calories & body fat you will burn, even while at rest. If you do not feed your muscles the adequate amount of protein they need daily, you will lose your awesome muscles! If you lose your muscles, you lower your metabolism! If you lower your metabolism, you don’t burn calories at an efficient rate, resulting in a gain of body fat. FEED YOUR MUSCLES PROTEIN! If you lift weights and train hard to build your muscles, but then do not eat adequate amounts of protein to feed those muscles, they will never grow. Why do all of the hard work in the gym, then not do the easy part by eating adequate amounts of protein to help build and repair those awesome muscles that you just tore down? 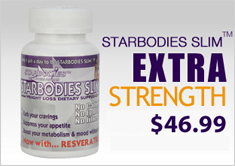 STARBODIES™ Whey to MUSCLE helps build your muscles, raise your metabolism, and burn more body fat! STARBODIES™ Whey to MUSCLE is loaded with L-Glutamine(9900mg per serving)! L-Glutamine is important because... When your body is under stress, whether it’s stress from everyday life or the stress you put your body under during a workout, your body releases a fat-storing hormone called Cortisol. Cortisol causes your body to store body fat as a survival mechanism, and break down your lean muscle tissue into amino acids to assist your immune system.You want to block Cortisol from storing this body fat & wasting your lean muscles. L-GLUTAMINE BLOCKS CORTISOL! L-Glutamine has been added to your STARBODIES™ Whey to MUSCLE to ensure that your body builds muscle, not wastes muscle! INGREDIENTS: Australian Ion Exchange Whey Protein Isolate, L-Glutamine, Natural Flavors, Sucralose (SPLENDA Brand No Calorie Sweetener). Directions: For a rich creamy shake, mix 2 heaping scoopfuls with 12oz. of water & ice, in blender.